Tunikata is an animal shaped like a tube and its body is covered by a mantle (tunic). These organisms have functions and impacts for ecology, pharmacology, people and the economy. However, the various important roles of the tunicate are not matched by information on abundance and diversity in Indonesia in general and the island of Bali in particular. Therefore, this study aims to determine the abundance, species composition and the diversity of tunikata in the waters of Jemeluk and Penuktukan, Bali, where each of these waters has a different coral reef morphology reef flats (Jemeluk) and reef slopes (Penuktukan). Data retrieval is done with a 25x2m2 belt transect and parallel to the shoreline. Determination of location of observation based on purposive sampling method. Analysis of the data used using the abundance formula, species composition and the Shannon-Wiener diversity index. The results showed that the abundance of tunikata in Jemeluk waters did not differ significantly between stations where the highest was found in stations 1 and 3, the lowest at station 2. But the abundance of tunicates in waters Penuktukan significantly different between stations where the highest in three and the lowest station on Station 1. There are nine kinds of tunicates on both waters where species Didemnum molle and Atriolum robustum is the type most commonly found. The highest diversity of tunicate species in Jemeluk waters is found in stations 1 and 3 and the lowest is at station 2, while the highest Penuktukan is located at station 1 and the lowest is at station 3. In general, the index of biodiversity in both waters is categorized as low. SAPUTRI, Ni Made Pitria Menala; PUTRA, I Dewa Nyoman Nurweda; KARIM, Widiastuti. Kelimpahan dan Keanekaragaman Tunikata (Ascidiacea) di Perairan Jemeluk dan Penuktukan, Bali. 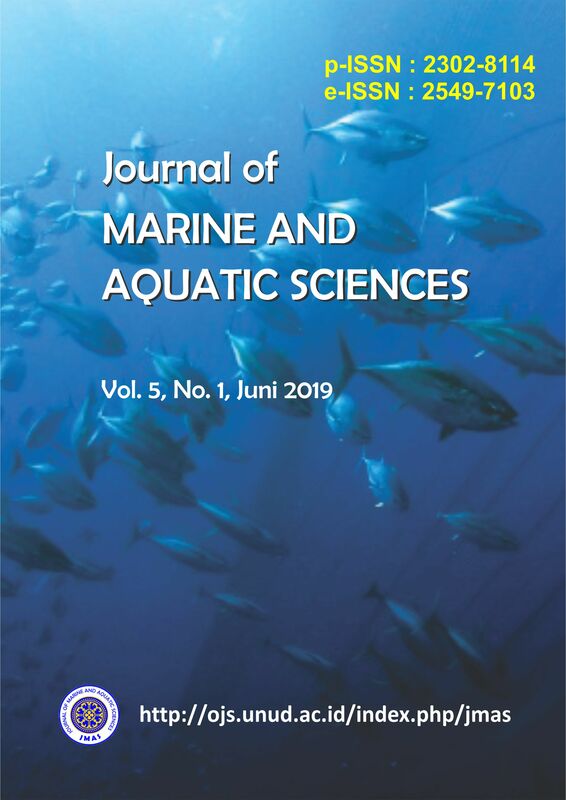 Journal of Marine and Aquatic Sciences, [S.l. ], v. 5, n. 1, p. 11-21, feb. 2018. ISSN 2549-7103. Available at: <https://ojs.unud.ac.id/index.php/jmas/article/view/37679>. Date accessed: 21 apr. 2019. doi: https://doi.org/10.24843/jmas.2019.v05.i01.p02.